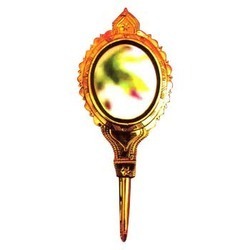 Aranmula Kannadi - Wonder Metal Handmade Mirror is a hand made metal-alloy mirror, made in Aranmula, a village in the state of Kerala, India. 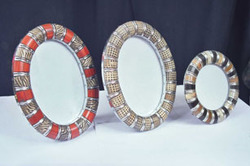 This metal resembles the glass mirror in every respect and any object placed against it, is reflected with complete clarity without any refraction. Zardosi Hand Embroidery is done on fine satin cloth. It is Available in many colors and designs as well as sizes. Rose Flower design macrame mirror hand made. We can also Make Macrame Products as per Your requirements, Your Design, Your Choice. Our products are Sky lamp, Hammock, Akash Kandil, Decoration Macrame.